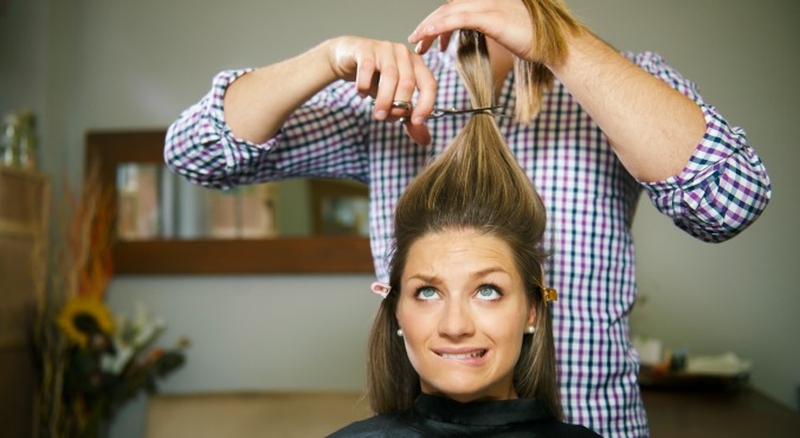 You will want to ask the 8 questions to your stylist. WHAT PRODUCTS WOULD YOU RECOMMEND? Flat, fine hair will work well with a thickening mousse or root-lifter. Frizzy, course hair needs a leave-in conditioner as well as a smoothing gel or serum. If you use any hot tools such as curling irons, flat irons, ect. remember to ALWAYS protect your hair with a serum for thermal styling. WHAT COLOR WOULD LOOK BEST WITH MY SKIN TONE? If you normally have a pink or reddish skin tone you will need a warmer color, such as red, copper or gold base. For olive skin tones, you may find that the cooler tones are best for you like an ash blue, violet, or green base tone. The right color is the key to loving what you see in the mirror. WHAT'S A GOOD CUT FOR MY HAIR TYPE? Everyone has a different hair texture and it is best to have a cut specifically designed for you. Define your hair type and start sharing ideas. Whether its thick, coarse, thin, fine or anywhere in between. WHAT'S A GOOD CUT FOR MY FACE? Not everyone that looks in the mirror likes what they see; but with the right haircut they can. For fuller, more round faces you may need perimeter layers to disguise and give the appearance of a thinner face. Always be sure to discuss bangs; the wrong shape of bangs can make or break your haircut. HOW SHOULD I STYLE MY NEW CUT? Styling hair is very much individualized, so make sure there is a open line of communication with your stylist. It is very important to listen carefully to what your stylist tells you and watch how they style it. If you are still confused, ask your stylist to walk you through the styling process. HOW LONG WILL IT TAKE TO STYLE MY HAIR? Styling your hair should not take hours to accomplish. Some hairstyles can simply be blown dry with the right brush for excellent results. With the right cut, your hair should be easy and fast to get the look you want. If your hair is very oily you may need to shampoo daily but apply conditioner to the ends only. Typically you should wash your hair every 2 or 3 days. However, some people can wash their hair once a week, and use a dry shampoo or revitalizer in between. WHAT SHOULD I BE DOING WITH MY HAIR ROUTINE? If you and your stylist have communicated clearly, this really shouldn't be an issue. Try to make sure you know how to care for your hair before you leave the salon. Once you have had the chance to style it yourself and you're still having trouble, contact your stylist to resolve any problems. Server responsed at: 04/25/2019 2:09 a.m.